When you need to lift a heavy weight, a pulley can make the job easier. 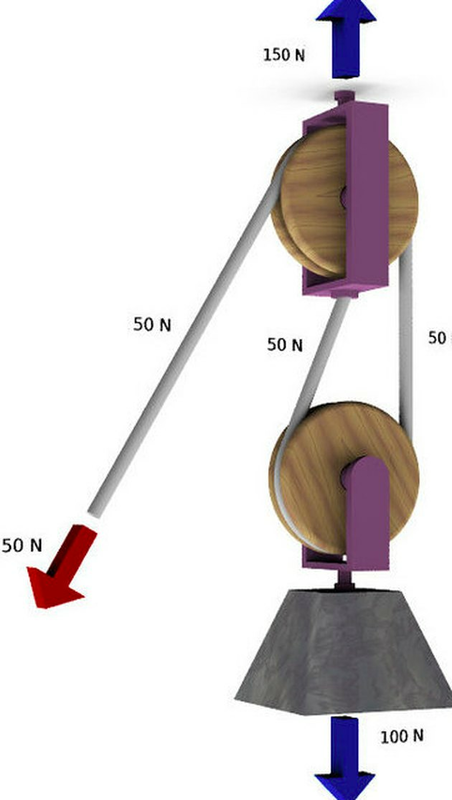 A pulley is one of the physic's six non-motorized simple machines—in this case, one that reduces either the effort necessary to lift a load or the direction in which the force needs to be applied in order to move the load—or it may do both things: reduce the force needed, as well as the direction. A simple fixed pulley allows you to lift a weight more easily than you could do by hand. Pulleys work by means of a grooved wheel that pivots around an axle. When the pulley is fixed to a solid anchor and a rope is threaded through the grooves on the pulley's wheel, it can be used to lift heavy weights much more easily than doing it by brute force. And you can double the effectiveness of a pulley system by increasing the number of pulleys in the setup. There are any number of ways you can combine multiple pulleys in a lifting setup. Any lifting apparatus that uses one pulley only is known as a simple or single pulley system, while any system that combines two or more pulleys is known as compound pulley. A simple pulley system using one wheel does not reduce the amount of force, but it does change the direction required to move the load. A compound system, on the other hand, actually reduces the amount of force required to move an object. Compound systems can get complicated. For example, you can rig a system using two pulley hubs that each have two wheels, and when looping the lifting ropes through all four wheels and the two hubs, the lifting power can be very substantial. The most well-known form of compound pulley is the well-known block-and-tackle, but pulley systems can get very elaborate in complicated machinery, using several hubs, each with two or more wheels. The sail rigging on large sailboats, for example, can feature some very sophisticated pulley systems. This article, though, will describe how to rig a fairly simple pulley system for ordinary household use to lift heavy weights more easily. A basic compound pulley system with two pulleys, each with a single wheel. It's important to know, however, that a pulley does nothing to reduce the overall weight of the object being lifted, and that whatever point you choose to anchor the fixed pulley needs to be up to the task of supporting the entire weight of the load. For example, if you are hoisting a riding lawnmower in the air in order to work on the undercarriage, or lifting a motorcycle in order to work on the tires, the pulley needs to be anchored in a way that will safely bear the entire weight. Failure to take this into account can lead to a serious accident. 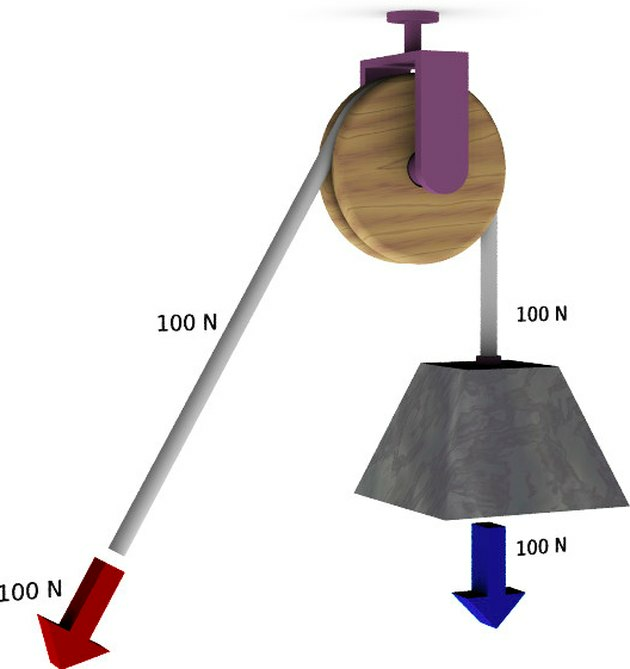 A simple pulley system does nothing to reduce the force needed to lift an object, but it does allow you to apply force in a different direction. If, for example, you want to lift a 100-pound weight, a simple pulley system will still require 100 pounds of force, but you'll be able to apply it in a more convenient downward or lateral direction rather than lifting it straight up. Determine the weight of the load you need to lift. Establish an overhead anchor point as close as possible to being directly above the weight you want to lift. If the weight load can be moved laterally, this may mean rolling or sliding it to a point directly beneath a suitable anchor point. Remember, though, that the point to which your pulley system is anchored overhead must be up to the task of supporting the load. Refer to the manufacturer's information for the pulleys to determine what weight the pulleys can lift. Use a single pulley, if its weight limit is sufficient to lift your load. If the pulley is not sufficient, move to the second set of instructions for using a compound pulley. Secure the fixed pulley to your anchor point. For example, in a garage, this can mean securing the fixed pulley to a chain wrapped around a sturdy ceiling joist. Don't expect an eye screw inserted into a ceiling joist to hold extremely heavy weights, as it may well tear free if the weight is substantial. It always better to wrap an anchor chain or cable around an overhead framing member. A sturdy tree limb can also serve as a good anchor point for the fixed pulley. Select a lift rope that is rated for the weight you want to lift, and with a diameter that properly fits the grooves on your pulley wheel. Thread one end of the rope through the overhead pulley hub so it fits into the wheel's groove, then attach the end of the rope to the object you wish to lift. Proceed to lift your load by applying downward or lateral force to the other end of the rope. If you plan to hold the weight object in a fixed position, choose an anchor point for the other end of the rope that is sufficient to safely hold the load in place. In this simplest form of a compound pulley setup, you'll need one fixed pulley that will be anchored overhead, and another pulley that will be attached directly to the load and which will move as you lift the load. The advantage of a compound system is that it really does reduce the force necessary to do the lifting. If a weight is too heavy to lift by hand, a compound pulley setup will let you get the job done. Attach the fixed pulley to the overhead anchor point, as described in Steps 1 to 3 above. Then, attach the movable bottom pulley directly to the load. Make sure both anchor points are sturdy enough to support to load that will be placed on them. When pulley systems fail, it is almost always at one of these two anchor points. A basic compound pulley system has two pulley hubs, each with a single grooved wheel. Attach the rope first to the bottom of the upper fixed pulley, then loop the rope down through the wheel on the moveable lower pulley. Now, loop the rope back up through the top fixed pulley. Make sure the rope is fully seated into the grooves on the pulley wheels. Proceed to lift the weight by applying downward or lateral pressure on the rope. If suspending the load, secure the free end of the rope to an anchor point capable of holding the load. How Much Weight Does a Pulley Take Off?